Over the past 15 years, we have helped hundreds of entrepreneurs, investors and high net-worth individuals acquire residency or citizenship in the US. 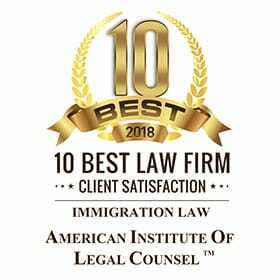 Specializing in EB-5 and other investment-related immigration opportunities, AmLaw Group's experienced attorneys will be with you through every step of the immigration process. Convenient way to send skilled professionals to the U.S. Excellent opportunity for a company to expand its presence in the U.S.
At AmLaw Group, we have over 15 years of experience and success in dealing with EB-5 visas and other complicated business immigration issues. Each and every one of our attorneys is fluent in at least two languages, and most clients work directly with attorneys, offering our clients a more personal—and professional—relationship in resolving their immigration matters. Our attorneys draw from a knowledge base that has been cultivated over 15 years of experience and success. This thorough understanding of the immigration system allows us to provide fast and professional solutions to immigration problems in the U.S.
We use our knowledge of trends and specifics of the U.S. market to help individuals with an array of immigration and corporate matters. Our attorneys are particularly experienced in assisting business people and entrepreneurs expanding their operations in the U.S. who often face not only unique immigration issues but also tax and other business challenges. Our AmLaw Group professionals have global experience from markets throughout the world with a particular focus on the Russian and CIS markets. All attorneys are fluent in at least two languages, putting our clients at ease throughout the immigration process. We strive to cultivate close relationships and interactions with all our clients throughout the immigration process, and we guarantee complete transparency and professionalism. Questions about EB-5 visas or other immigration options? At AmLaw Group, our mission is help people realize their dreams and achieve their goals. We pride ourselves on providing honest and professional support while guiding you through the complex immigration process. Our number one goal is helping you begin the next stage of your life.